I noticed that the Nails Inc. After Party set has been on clearance for quite a while on Sephora.com and it's still not sold out. I'm actually kinda surprised about that. I bought my set right when it came out 'cause it looked so amazing with all that glitter and holo and stuff, I swatched it and even wore the colors a bunch of times, but for some reason never posted about it?? Whatever, it's still on sale and I'm posting about it now. Look. Glitter. Nails Inc. Covent Garden Market. 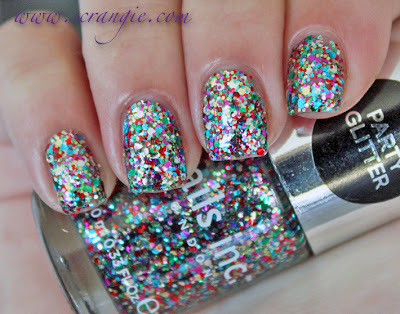 A multi-size, multi-color glitter in a clear base. Reminiscent of Lippmann Happy Birthday but not a dupe. A black creme base with tiny holographic glitter. Dries rather gritty but evens out with an extra coat of topcoat. My favorite of the three. 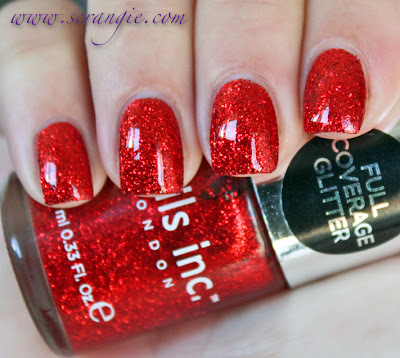 A red jelly base with medium-sized chunky red glitter. 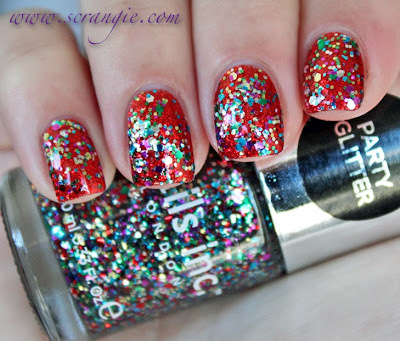 I am always drawn to these jelly-glitter reds. I can't help it, they're just so cool. They look like lava! One coat of Covent Garden Market over Soho Street. The formula on these isn't great, but it's tolerable. Not smooth and dreamy like the Nails Inc. creme formula, these glitter shades are on the chunky and clumpy side. I needed to be careful to let each coat set before applying the next or I ended up with thick spots. Three coats of each. Dry time is average and all the shades need at least two coats of topcoat. Soho and Covent chip quicker than Disco. So, yeah, this is still in stock at Sephora, $19 marked down from $25, and they're full-sized polishes. Pretty good deal for Nails Inc. Not the best application or durability, but the colors are fun. These look fabulous, well done on nabbing them before they vanished! I'm really loving that amazing glassy-effect of Soho-Street! OMG they are all amazing!!! wow!! Always with interest I read your posts, you are very beautiful pictures! 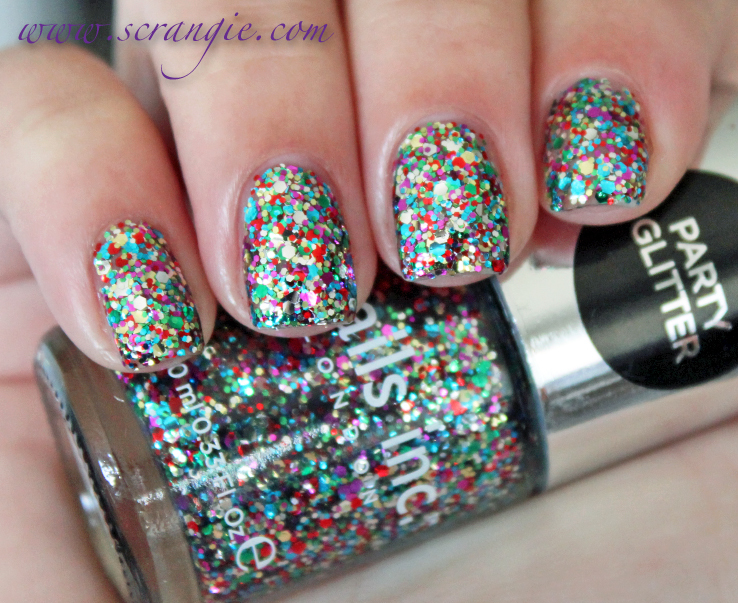 Serious glitter-- I deeply crave the black shade. I have the set too and I love them!! I bought this set and I love it. Such fun colors! I keep looking at that "Soho Street" and have hum-hawed about it over and over. I am a real nut about China Glaze "Ruby Pumps" and that's what I have equated it to. If the formula isn't all that great, I'm glad I didn't go for it. Also, the swatches I had come across for "Disco Lane" led me to believe that "Storm" from Zoya may have been a more impressive payoff. I am so glad to have come across your post. Now you have confirmed my suspicions...at least in MY eyes LOL. Although, if it would have been purely based on your photos, I would have been sold. I think you could polish with poop and make it look gorg! I don't mean that to be gross, just proving a point and providing a well deserved compliment! wow these are sooo pretty!